The March of the Living will be held in Ponara on April 22, at 4 pm. For the tenth time, the marchers will walk from the Ponary station to the Ponary’s forest, where in the years 1941-1944 about 100 thousand people were murdered (including 56 to 70 thousand Jews and about 20 thousand Poles). The forest in Ponary, near Vilnius, was the place of mass murders committed by SS, German police and the Lithuanian police in collaboration with Germans during World War II. Germans, assisted by Lithuanian volunteer units, have murdered about 100,000 people here. People. Including about 60-70 thousand Jews, about 20 thousand Poles – Vilnius intelligentsia, Home Army soldiers as well as Romanies, Russians and Lithuanians. 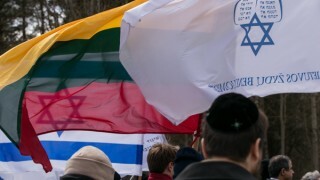 The authem of the Vilnius ghetto will be sung at the end of the march. It will be performed by the vocalist of the “Fajerlech” band- Michail Jablonskis. The author of the song is former ghetto prisoner – Hirsz Glik. Tłumaczenie by Piotr Szeląg	w ramach praktyk w Europejskiej Fundacji Praw Człowieka, www.efhr.eu. Translated by Piotr Szeląg	within the framework of a traineeship programme of the European Foundation of Human Rights, www.efhr.eu.